Submitted by mas_admin on Mon, 2008-09-29 23:41. Nicolai Ouroussoff, The New York Times architecture critic, wrote a rambunctious article about the handful of New York City the should face the wrecking ball. 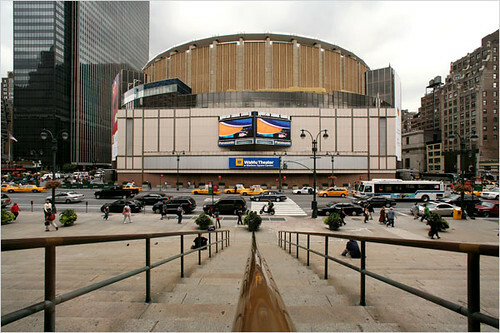 It's no surprise that Madison Square Garden topped the list. No site in New York has a darker past than this one. The demolition of the old Pennsylvania Station, the monumental McKim, Mead & White Beaux-Arts gem that stood on this site until 1964, remains one of the greatest crimes in American architectural history. What replaced it is one of the city’s most dehumanizing spaces: a warren of cramped corridors and waiting areas buried under the monstrous drum of the Garden. Over the years the city has entertained dozens of proposals to improve the station, but none have amounted to much of anything, thanks to New York’s byzantine development politics. I propose we demolish the Garden. As arenas go, it is cramped and decrepit. And with it gone we could begin to imagine what a contemporary version of the old Penn Station: a monumental gateway to the 21st-century metropolis. See that blue "WAMU Theater" sign in the photo? It won't be there for long. According to the Times, since the Feds seized WAMU, the theater is going to have to change its name. Read Name Change Is Likely for WaMu Theater by Richard Sandomir in The New York Times. Read New York City, Tear Down These Walls by Nicolai Ouroussoff in The New York Times.